Parole Media Player 1.0.2 will likely be included in Xubuntu 19.04 (we’ve uploaded it!). Other distributions will likely add it soon. If you can’t wait or want to install from source, download it below. Exo once again uses the same thumbnail directories as other applications (Xfce #14799), resulting in reduced disk usage. Where everything else moved to ~/.cache/thumbnails quite some time ago, Exo continued to use ~/.thumbnails. Enjoy all the extra disk space! Additionally, a long-standing bug where the type-ahead search widget would be drawn partially off the screen for maximized windows, has been fixed! 2018 has been a busy year for Xfce & Xubuntu. As we enter 2019 and continue to inch closer to Xfce 4.14, let’s look back at one of the busiest development years in a while. MenuLibre 2.1.4 introduced some useful new features to the popular menu editor, including a Test Launcher button to try out a launcher before saving and the Parsing Errors dialog to easily identify menu configuration issues. The Parsing Errors dialog in MenuLibre simplifies menu cleanup and debugging. Exo 0.12.0 was the first stable Xfce 4.14 release for the Xfce application development library. The new release included support for both GTK+ 2 and 3, and added Brave, Geary, Google Chrome, and Vivaldi to the natively supported application defaults. MenuLibre 2.1.5 expanded it’s support of desktop environments. With this release, MenuLibre’s powerful menu editing options are available for Budgie, GNOME, KDE Plasma, LXDE, LXQt, MATE, Pantheon, Unity, and Xfce. MenuLibre 2.2.0 was finally released with an expansive list of improvements. Expanded desktop environment support, easy window identification, launcher testing, and parsing error reporting are just a few of the key improvements. Parole Media Player 1.0.0 included playback performance updates, automatic video output selection, and improved podcast and live stream support. The new Mini Mode reduces the player to a small window that simultaneously stays out of the way and in reach. Xfce PulseAudio Plugin 0.4.0 introduced device manage and MPRIS support to the audio management plugin. Available input and output devices can be selected from the plugin menu, immediately moving streams to the new device. MPRIS support adds media player controls for supported applications. Xfce Settings 4.12.2, 4.12.3, and 4.13.2 improved multi-monitor support for both stable and development releases. The mouse cursor can now be shown with the press of a key, configurable with the Xfce Settings Manager. The Xfce PulseAudio Plugin makes it easy to manage devices and play your jams. Xubuntu 18.04 was released! I featured some screenshots here. Xubuntu 18.04 “Bionic Beaver”, an LTS release supported for 3 years, was released with 32-bit and 64-bit downloads available. This release included some new desktop applications: Some MATE components replaced their GNOME counterparts for improved desktop consistency; Xfce PulseAudio Plugin replaced the Sound Indicator; and the Xfce Notifications plugin, featuring a new Do Not Disturb mode, was added to the panel. The results of the Xubuntu 18.04 wallpaper contest were exceptional. This was the first month I started published monthly news roundups. For an in-depth look at May’s development progress, check out the June Development Update. Thunar 1.8.0 and 1.8.1 were the first stable GTK+ 3 releases of the Xfce file manager, offering major usability and developer-friendly improvements. The pathbar now includes navigation buttons and a much tidier location selector. GObject Introspection for Thunar’s plugin library makes it possible to develop plugins in a number of programming languages. Xfce Settings 4.12.4 and 4.13.4 featured improvements to display manufacturer recognition. The mappings were updated and various manufacturer names were simplified for better screen real estate. 4.13.4 introduced Xrandr display scaling, making it possible to scale the X display and all applications. Xubuntu 18.04.1, the first point release in the Bionic Beaver series, became available. At this time, users of a prior release should have received an upgrade notice. This release included several stability and performance improvements. Xfwm 4.13.1 included a massive amount of updates, including a full port to GTK+ 3 and various fixes. This component is one of the critical pieces of the Xfce 4.14 release, so it’s great to see it humming along. Elementary Xfce’s Manila folder icons headline September’s development updates. Xubuntu 18.10 “Cosmic Cuttlefish” featured a number of appearance updates and Xfce 4.14 components. Our icon theme, elementary-xfce, was updated with new manila folder icons and optimized, resulting in a smaller install size and improved performance. Many more GTK+ 3 Xfce applications were included. Xfce Screensaver 0.1.0 (and 0.1.1) was announced as a new screen locker and screensaver for Xfce. This application is a port of MATE Screensaver, adapted to tightly integrate with the Xfce desktop. It shares theming with LightDM GTK+ Greeter to guarantee a consistent login and lock experience for users of both. 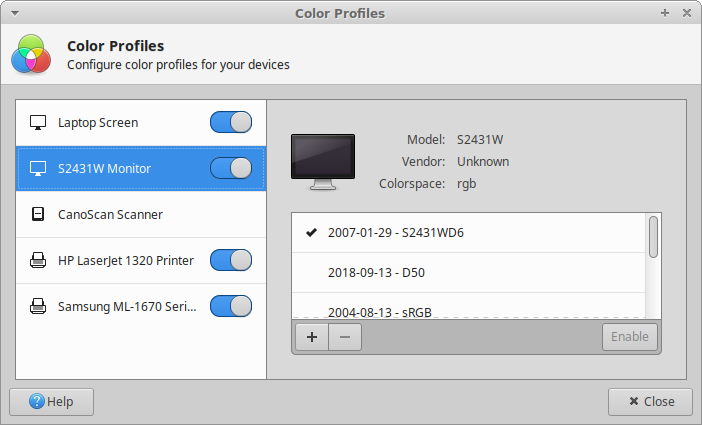 Xfce Settings 4.13.5 featured the new display profiles: saved multi-monitor layouts that are automatically applied when a new monitor configuration is detected. This works with multi-monitor layouts as well as switching a laptop to use only the external display when connected. Xfce Screensaver 0.1.3 is the first beta release of the new Xfce Screensaver. It features an expanded configuration dialog, better support for X11 Screensaver and XDG Screensaver, and fully documented functionality. With a focus on improved code quality, contributors should have a much easier time with the project going forward. Xfce Screensaver is compatible with all Xscreensaver themes. Lubuntu and Xubuntu announced that they will no longer ship 32-bit ISOs for Ubuntu 19.04 and onwards. Ubuntu 18.04 will continue to be supported for the 3-year LTS support window. André Miranda published The Ultimate Contributor’s Guide to Xfce, which is definitely a worthwhile read for new and existing contributors. Look out for Xfce 4.14, we’re so close! Keep an eye out for more updates in the coming months. What better way to start a new year than with a release? All available configuration options are now available in the Preferences dialog, boosting the easily accessible options from 4 to 13! Idle time is now based on the X11 Screensaver plugin instead of the GNOME Session Manager. Xfce Screensaver now respects the xdg-screensaver state, inhibiting the screensaver when using apps like Caffeine or watching a fullscreen video. Screensaver and lock screen functionality can easily now be toggled separately. All deprecated DBUS methods and signals have been removed from the documentation. This is the first beta release of Xfce Screensaver. While still not recommended for production machines, this is a great time to test and report bugs so we can put together an awesome stable release soon. Xubuntu users (18.04, 18.10, and 19.04) can grab the package from the Xubuntu QA Experimental PPA. Remember to also remove or exit light-locker and start xfce4-screensaver (or log out and back in) and add support for xfce4-screensaver to the xflock4 script.